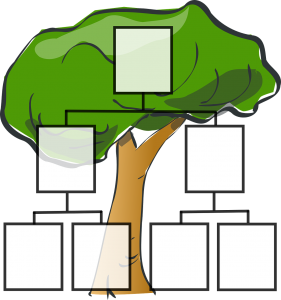 One thing every genealogist spends time and effort on is the creation of their family tree. It is the sort of project where one things leads to another. There is always more to do! The hardest part is getting started. Here is how to start building a family tree. There is more than one way to begin. You could choose to start with yourself. Doing so provides you with a good example that shows what kind of information belongs in a family tree. It’s also easy to do! Your place on the family tree should include your full name. Put in your date of birth. If you changed your name after getting married, you should include your “maiden name”. Your family tree can include notes that show how you are related to everyone else. (If so, then your spot would say “self’). Some family trees include photos of each person on the tree. Family trees often visually connect two people who are married. Those two people will be connected to their children. Usually, one generation of your family will sit on a line above the next generation. Don’t forget to add the death date of family members who are deceased. There are a wide variety of family tree templates online, and many can be downloaded and printed out for free. The templates function like a “worksheet”. It’s ok to make a mistake on them because you can easily print out a new copy and start over. Templates are a useful tool for keeping important information about each family member organized and easy to read. The most important thing to understand about how to start building your family tree is that you don’t have to fill in the entire tree all at once. Work slowly, and make sure the information you are adding is accurate. It is advisable to do research on each family member before adding them to the family tree. Find credible evidence that proves someone’s birth date or death date. Avoid mistakes! Many genealogists find it helpful to build their family tree online. Genealogy websites can provide you with an online template and also with access to vital records. If you are just getting stated, it would be smart to choose a genealogy website that will let you build your family tree on it for free, like FindmyPast. Free services give you the opportunity to discover the fascinating world of genealogy without having to immediately make a financial investment.